The Baltimore Ravens briefly trailed against the Cleveland Browns Sunday, falling behind 7-3 early in the second quarter, but quickly squashed any upset talk, outscoring Cleveland 24-3 the rest of the way to maintain separation between the AFC North’s upper and lower tiers. The Ravens got a rushing touchdown from Joe Flacco, a receiving score from Benjamin Watson, and a fumble recovery score from Brandon Williams en route to the victory, which got the team to 8-6 and kept them in line for a possible playoff berth. Cleveland turned the ball over four times in the loss. After a rough performance in Week 14 that wound up being misleading in terms of headline statistics, Flacco turned in one of his best performances of the season against the Browns and the numbers backed it up. The Ravens’ ground game kept him ahead of the chains for the most part and allowed Flacco to work the short and intermediate game to keep the offense moving downfield efficiently. Flacco hit on some key plays down the middle of the field at all levels, completing 18-of-25 for 208 yards and his touchdown passes on throws targeted between the numbers. The Ravens’ most productive receiver, Wallace put one ball on the ground Sunday but caught six others, converting four of those catches into first downs. His longest gain came down the left sideline midway through the second quarter. Separating from Jason McCourty for a 30-yard gain, this marks the sixth game this season that Wallace has collected at least one pass with a gain of 20 yards or more. 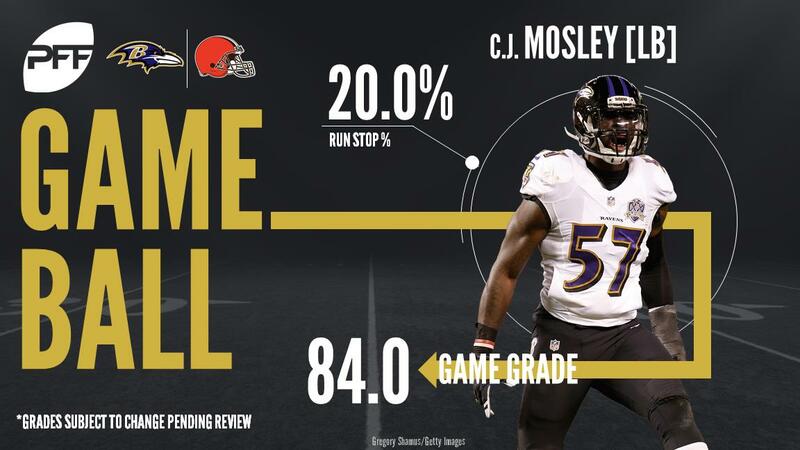 It was a strong all-around performance from Mosley, who made plays in all three phases of the game for the Ravens defense. His three defensive stops were his most in a single game since the Week 12 win over Houston and he picked up two hurries (his first multi-pressure game since Week 11) and a batted pass that almost turned into an interception for Terrell Suggs, but for DeShone Kizer’s intervention. In coverage he added a pass defense, breaking up a third-down pass to Duke Johnson, while allowing only one catch for 9 yards in coverage, a much easier ride than he endured against the Steelers last week. Smith picked up three pressures in the game, but it was his strip sack in the third quarter that was arguably the game-defining play. This was Smith’s first sack since Week 8 and saw him beat Spencer Drango to the outside almost immediately, swiping the ball out of DeShone Kizer’s hand as he threw from the end zone to setup Brandon Williams’ recovery just inside the goal line for six points. Terrell Suggs led the Ravens in volume of pressures (10) but Smith certainly made his count. For much of this game it felt like the battle of the running back tandems, with the receiving duo of Johnson and Danny Woodhead complementing Isaiah Crowell and Alex Collins’ more downhill run-focused games. Johnson added to his work in the passing game with a rushing touchdown, beating Terrell Suggs’ contain to bounce to the edge for the Browns’ only TD. Johnson forced two missed tackles as a receiver to take his season total to 22, trailing only Alvin Kamara (27) among running backs in the passing game. Another step back toward assimilation with the Browns offense for Gordon, who spread his production out more evenly through the game this week than last week against Green Bay but still struggled to come up with the meaningful impact to spark the Browns offense. Those flashes have been there in previous weeks and if he can combine those with the pair of third-down conversions he collected in the second half he’ll be well on his way to giving the Browns the receiving threat they need. Another productive showing from Kirksey who racked up 5 stops for the sixth time this season, putting his season total at 57, 6 shy of his career high set last season. Kirksey made the most of plays in front of him, picking up 3 of his 5 stops against the Ravens’ short passing game. Kirksey tied for the team lead in stops with fellow LB James Burgess Jr., with all three of the Browns’ starting linebackers playing every defensive snap. Nassib picked up a trio of stops for the second straight home game and was productive in the passing game as well. Nassib picked up a pair of pressures (1 hit, 1 hurry) and added his fourth batted pass of the season midway through the third quarter, swatting away a screen pass. Nassib has racked up more production in the last two games in terms of stops, batted passes, and total pressures than he had in the previous four games combined.